In small bowl, combine goat cheese, mint, parsley, chives and salt; blend well. Spread mixture on 2 slices of the bread. 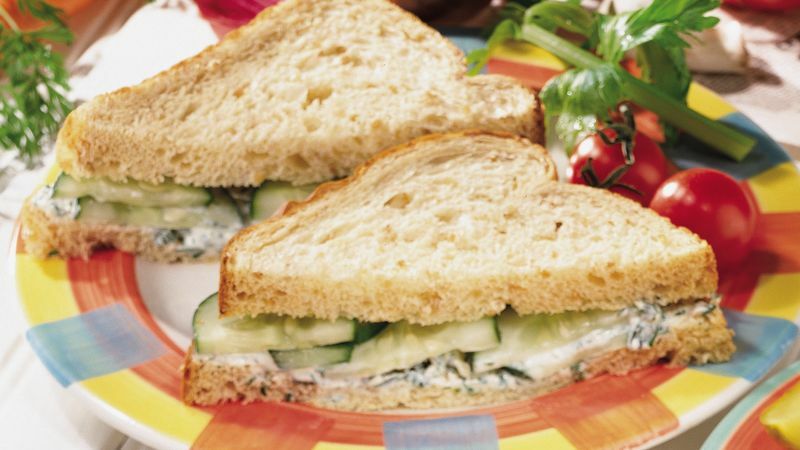 Top with cucumbers and remaining slices of bread. Chèvre cheese is goat’s-milk cheese; chèvre is French for “goat.” Firm, room-temperature goat cheese can be thinned with a tablespoon of milk. Stir the milk into the cheese, then continue with the recipe as directed. Chives are a hardy perennial herb related to onions and leeks. Their long bright-green stems are hollow. Both the stems and the pretty purple flowers make attractive, aromatic garnishes. Add chives directly to a recipe by snipping the long stems with a scissors. For a refreshing appetizer, try Cucumber-Goat Cheese Crackers. Spread the herbed goat cheese on crackers. Top the cheese with a slice of cucumber and a few snipped chives.